You will see so much beauty and taste so much wine on your five-day journey through the wine regions and coastal parks of Southern Australia, you will think you've been on holiday for weeks! Beginning and ending in the thriving city of Adelaide, your journey takes you to the charming Germanic towns of the Barossa Valley, to the historic river town of Mannum, on to the vineyards and beaches of Robe, and to Mount Gambier, famous for a plethora of outstanding nature attractions. Back in Adelaide, enjoy the Botanic Gardens, as well as the art galleries, museums, and dining. The first leg of your trip is a short one, which will allow you time to pick up and get familiar with your vehicle, and still have time to drive to your caravan park and settle in. Drive 72 km north-east (for around an hour and a half)) to the town of Tanunda in the Barossa Valley. In the heart of the Barossa Valley wine region, this park features an Internet Caf' with wireless Internet, gas and electric BBQs, laundry facilities, children's playground, bathrooms for babies and also for the disabled, bicycle hire, and an information kiosk. Choose from cottages, ensuite cabins, park cabins, on-site caravans, van sites, and camping sites. Accommodations are completely self-contained, with refrigerator, cutlery, etc. Located at the start of the Barossa Valley, this park provides travelers with insider's advice on how to make the most of your stay in the region. While the park is limited on amenities (free BBQs, shelter with hot and cold water), shops, a swimming pool, and other necessities are within walking distance. Choose from a variety of powered sites: grassy, grassy with concrete slab, concrete slab, and gravel, as well as unpowered sites. The park also offers self-contained ensuite cabins with TV, shower, and air conditioning, and deluxe ensuite cabins, wheelchair access ensuite cabins, and self-contained units. Drive around 80km south-east ( around an hour and a half) to the riverfront town of Mannum. Located on the Murray River, Mannum is the birthplace of the Murray Paddlesteamer. Varied opportunities to enjoy water abound in and around this town, from the river cruises, to the boardwalk, to the Mannum Waterfalls. Stop for a picnic at the Mary Ann Reserve, peek in a few antique shops, and explore the beautiful natural setting in this historic town. There are two spectacular places to take in the seaside views, the Beacon Hill Lookout Tower, and the Obelisk on Cape Donbey. Great photo opportunities! Robe's status as a Wine Region became official in 2006 (the region was formerly included in the Mount Benson Wine Region). Visit more than a dozen wineries, known for superb cellar sales and fun events for travelers and groups. 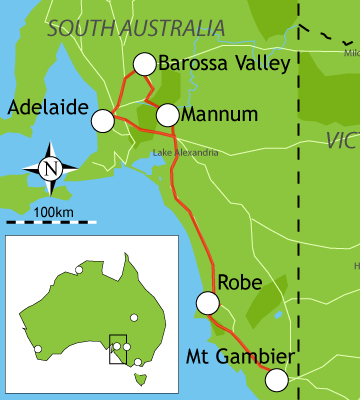 The next leg of your journey takes you 131 km south and east (under two hours) via the Princes Highway to Mount Gambier. A thriving city built on an extinct volcano, Mount Gambier is a nature lover's paradise. Numerous lakes, parks, caves, ponds, and renowned public gardens could captivate you for days. The city is a recreational hub, and you will find much to do at the Crater Lakes complex that includes the famous Blue Lake, and at the popular Engelbrecht Cave. If outdoor fun is not for you, enjoy wandering through art galleries, shops, or continue your wine tasting adventure in the nearby Coonawarra Wine Region. The final leg of your trip is the longest, 449 km north-west (about 5 ' hours) up the coast Princes Highway, Wellington Road, and the South Eastern Freeway, back to your starting point. Adelaide, the wine and festival capital of Australia, is vibrant, attractive and well planned, filled with colonial-style buildings. Enjoy a stroll along the main boulevard, North Terrace with its museums, galleries, and Tandanya ' the National Aboriginal Cultural Institute. Adelaide is close to nature, fronting the ocean waters of Gulf St. Vincent, beside the River Torrens and surrounded by parkland and the Adelaide Hills.